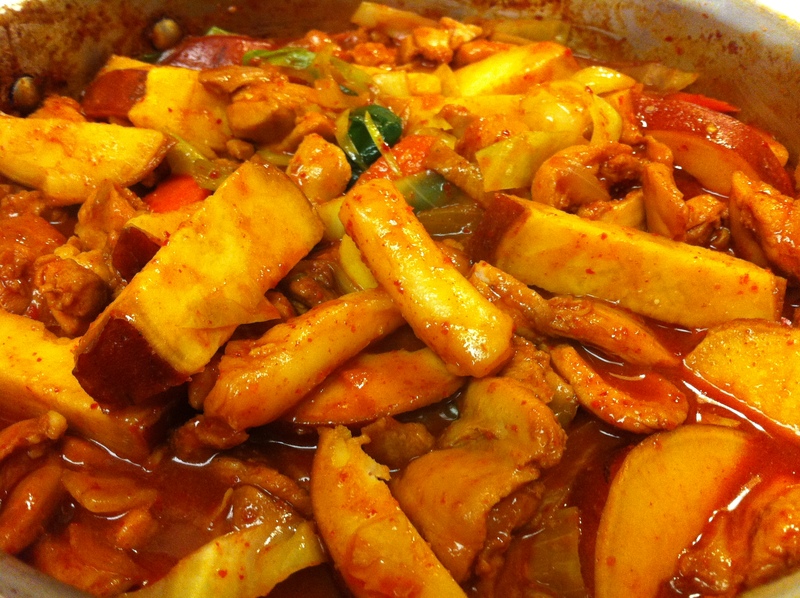 Dakgalbi is a popular dish, especially amongst young Koreans. 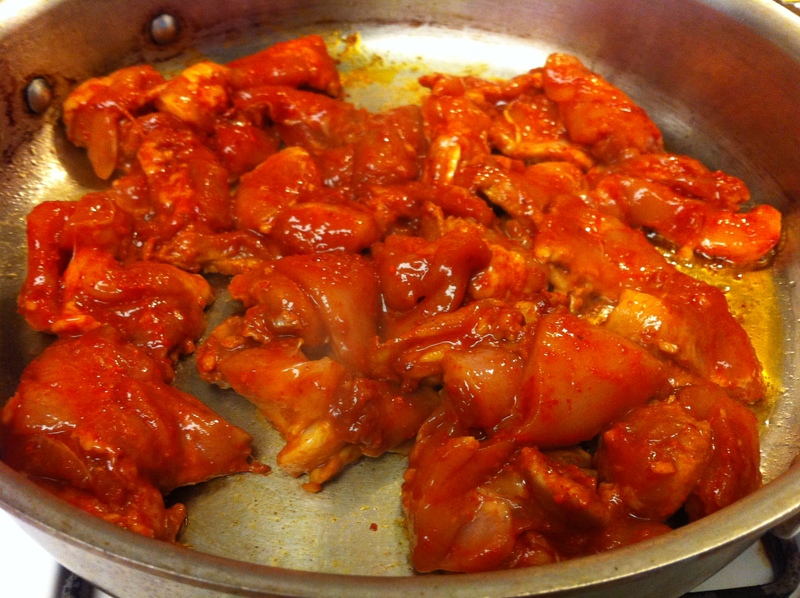 Unlike my “Mom’s Chicken Galbi“ that I posted a few months ago, this chicken galbi is the traditional spicy kind. Dakgalbi is most famous in the Chuncheon area of Korea, which is about two hours away from Seoul and a popular area for its resorts and water sports these days. I guess it is like the Hamptons fore New Yorkers for those in Seoul. 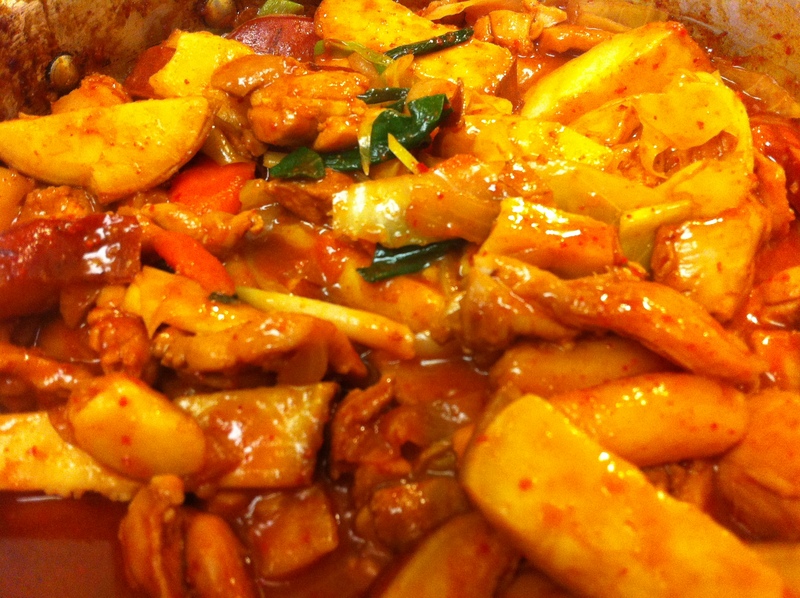 In any case, dakgalbi is made with variety of vegetables along with chicken, which makes it a perfect one-pot dish. You can serve it with rice. You can also eat the chicken and vegetables first then add rice directly to the pan and make fried rice using the leftover sauce and meat, which is how most restaurants serve this dish. This fried rice is actually the best part of eating dakgalbi. 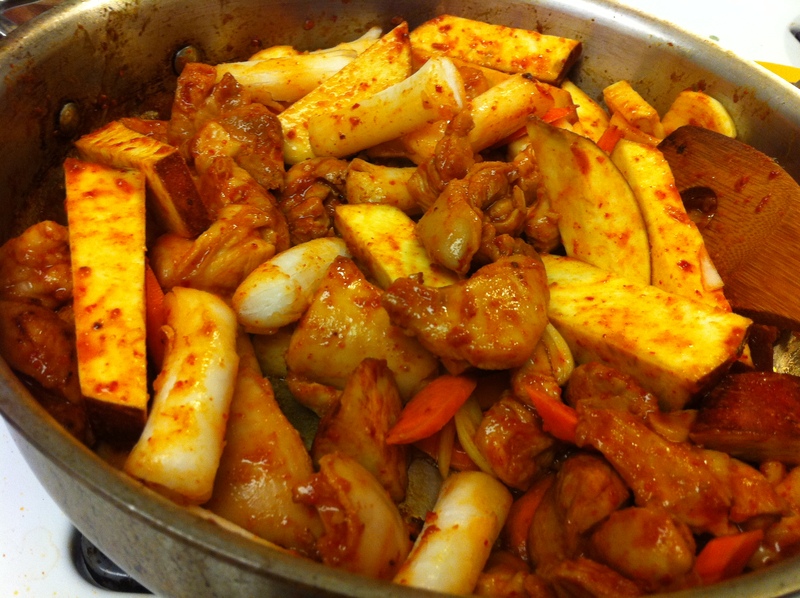 I usually serve dakgalbi with rice, and then make fried rice with the leftover the next day for a second meal using the recipe. Combine all the marinade ingredients. Restaurants usually use coke or sprite in the marinade but I used sparkling water instead. You can also skip the curry powder if you do not like curry but a bit of it gives it a more depth to the flavor profile. 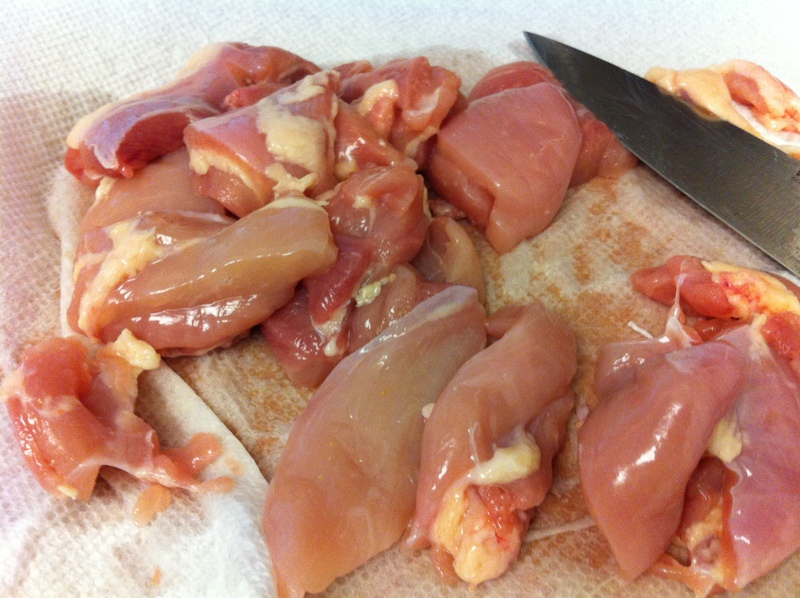 I used skinned deboned chicken thighs but you can use any part you prefer. Just make sure you remove the skin and bones. Cut into bite size pieces. Mix the chicken with 2/3 of the marinade. 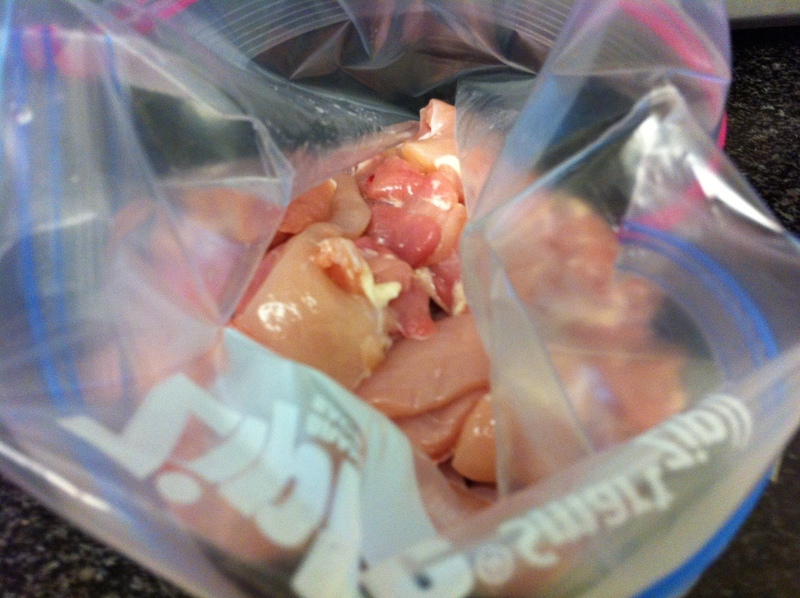 I placed the chicken in a Ziploc bag to ovoid doing more dishes and to save space in the refrigerator. 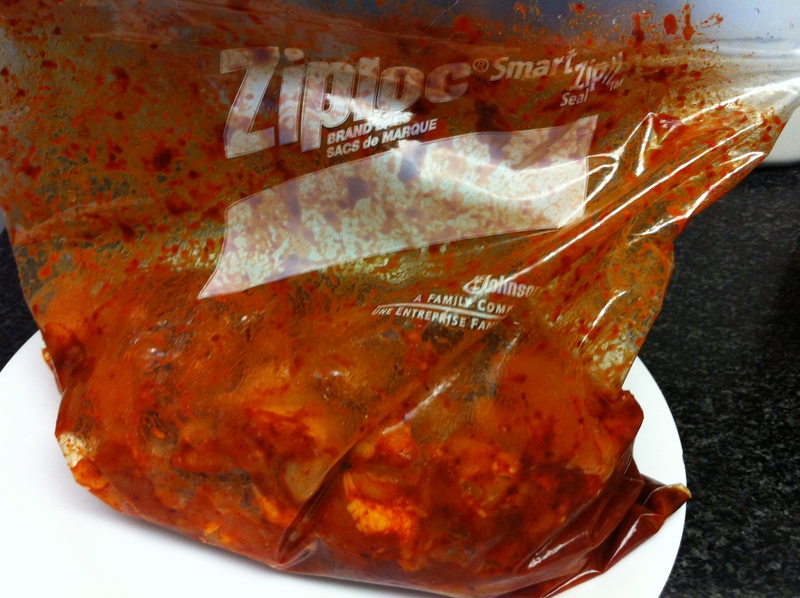 Marinate the chicken for at least 2 hours or preferably overnight. Heat a large sauté pan or a skillet on medium-high heat. Drizzle some vegetable oil. Sauté the marinated chicken for about a minute or two. Add the sweet potatoes. Cook for another minute. 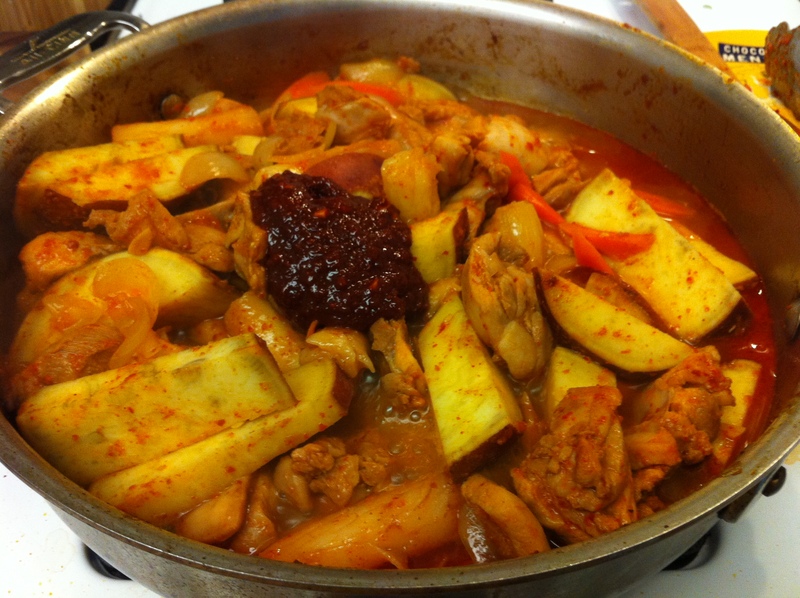 Add the rest of the ingredients except for the kketyip (깻잎, perilla leaves) and scallions. 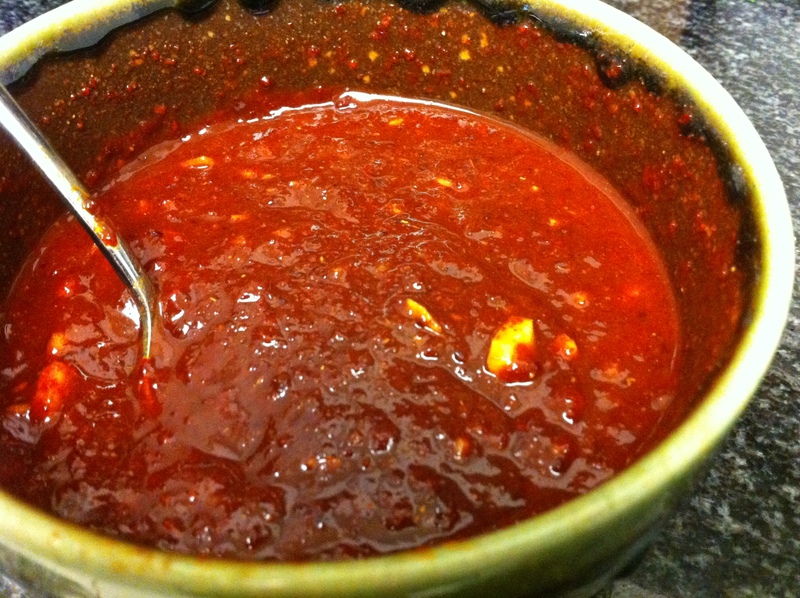 Add about 2 tablespoons of the remaining marinade and stir. After about a minute of sautéing, add about 2 cups of water and cover with a lid or aluminum foil. 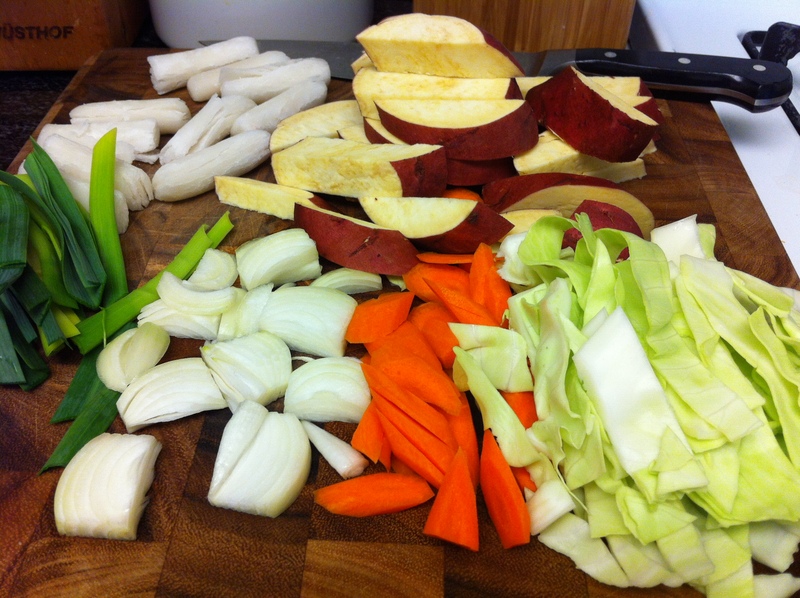 Cook for 10 minutes until the chicken and vegetables are fully cooked. Stir occasionally. Taste and add more marinade if needed. If you do not want to add more spice, you can season with soy sauce. Stir in the kketyip (깻잎, perilla leaves) and scallions. 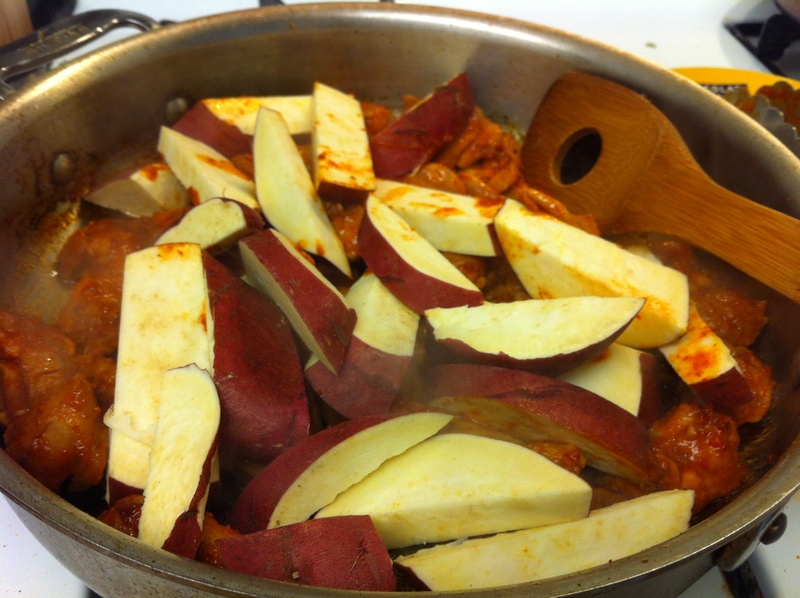 Cook for another 2-3 minutes with the lid open until the sauce is thickened and reduced. 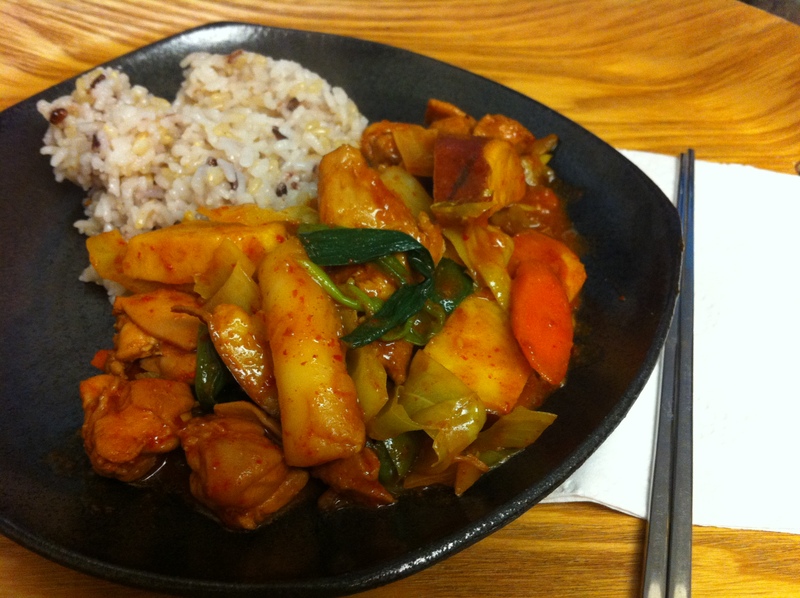 This entry was posted in Good for dinner, Good for lunch, Main Dish, Meat/Chicken and tagged Chicken by gangnamkitchen. Bookmark the permalink.